NEW for 2018! Daniel Tiger's Grr-ific Show! Lake Compounce, New England’s Family Theme Park, has big news for 2018! New this season is the Preschool Play Pass, giving FREE admission for kids 4 – 5! The registration deadline is March 31, don’t wait! The new Preschool Play Pass gives children ages 4 - 5 years old FREE admission during the 2018 season! A parent or guardian must register their 4 - 5 year old online before March 31 by completing the online registration form. An adult season pass must be purchased at the time of online registration for the Preschool Play Pass. Proof of age (birth certificate or travel passport) must be shown at the park between May 5 and June 3 in order to activate the pass. As always, children 0-3 years old are allowed in free and do not require a pass. To learn more about how to get a FREE Preschool Play Pass, visit lakecompounce.com/prekpass. Now is the perfect time to take advantage of the Preschool Play, with Daniel Tiger coming to Lake Compounce! Lake Compounce has partnered with The Fred Rogers Company to debut Daniel’s Grr-ific Day, a new musical show opening summer 2018 starring Daniel Tiger, the main character from the award-winning animated preschool series, Daniel Tiger’s Neighborhood (http://pbskids.org/daniel), along with his friend Katerina Kittycat. 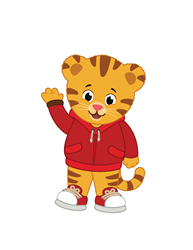 After the show, kids will have the opportunity to meet and greet Daniel Tiger and Katerina! Lake Compounce is New England's premier family theme and water park and is located in Bristol, CT. Featuring over 50 rides, shows, and attractions, Lake Compounce is the oldest continuously operating amusement park in North America, celebrating its 172nd season. This park is home to Connecticut’s largest water park, Crocodile Cove. Lake Compounce is owned and operated by Palace Entertainment, one of the leading leisure park operators in the United States. Palace Entertainment owns and operates eight water parks, six theme parks, two animal parks, and five family entertainment centers across 10 different states. For more information, please visit lakecompounce.com, or connect with us on Facebook, Twitter, and Instagram.